In the famous old whisky town of Dufftown lies Balvenie, just a few steps away from Glenfiddich distillery. Whilst the distilleries share a founder, owner and water source, they are very different in style, with the Balvenie renown for its subtly sweet and rich whiskies, with highlights of honey and nuts. The distillery has released many cult classics- most notably the stellar ‘Tun’ lines. With a history dating back to 1892, when William Grant founded the distillery as the sister operation to Glenfiddich, Balvenie has been producing some of Speyside’s finest whisky ever since. Named after the nearby towering ruins of Balvenie castle, the distillery has maintained a close connection to the local land- fuelling its fires with hand-cut peat from nearby environs. This is just another example of a distillery that does things the ‘old-fashioned’ way, as it also maintains floor maltings, adding a unique element to the distillery’s spirit. Indeed, the distillery is known as the ‘Complete Distillery’ as every process- from malting the barley, to bottling the spirit- occurs on site at Balvenie. To this end they employ a coppersmith and cooper onsite for barrel making and still repairs, procedures that are often outsourced by other distilleries. They say this ensures that the barrels and the stills, the two most important distillery features for the flavours of a whisky, are kept in pristine condition. Balvenie takes this artisanal approach to everything it does, producing beautiful bottles and packaging of the highest quality, showcased most spectacularly in their 50-year-old expression, which was bottled in hand blown glass, and packaged in a specially designed tube which showcased local varieties of wood, hand crafted by an expert carpenter. This does not mean, however, that the distillery is stuck in the past, with only "the traditional way", rather, through its expansive and interesting use of casks and vattings – as demonstrated by their fabulous ‘Tun’ bottlings, which also pushed the boundaries of none age stated malt whiskies. William Grant is born, a member of the historic Clan Grant family of Speyside. William joins a local distillery (rumoured to be Mortlach) as a bookkeeper. Over the 20 years he worked there he gained a taste for whisky and a knowledge of the production techniques, eventually rising to be the distillery’s manager and resolving to build his own distillery when he got the chance. William Grant had long harboured an ambition to build a distillery, something he finally achieved in 1886, building Glenfiddich. The first spirit trickles from Glenfiddich’s copper stills- bought second hand from Cardhu distillery- on Christmas day of this year. Grant expands his portfolio by building his second distillery, in many ways a sister distillery to Glenfiddich, Balvenie. Originally known as Glen Gordon (after another branch of the Grant family), Balvenie is founded with equipment from Lagavulin and Glen Albyn, and the rebuilding of the Balvenie New House- a mansion originally built in the 1700s. The first Balvenie spirit runs from the stills in May of this year. The Grant begins to bottle its own whisky after the family’s foremost customer, the Pattisons blending house, goes bankrupt. One of the Grant’s first blends, Standfast, quickly achieves popularity and becomes one of their flagship brands. The company that owns Glenfiddich and Balvenie changes its name to William Grant & Sons, which has remained the same ever since. In a forward thinking marketing move typical of the Grant operation, Charles Gordon, who married William’s daughter Isabella, begins travelling the world selling the whisky. Gordon’s work pays off as he has set up distribution systems and networks of contacts in over 30 countries. After many years of steady distilling (despite two world wars and the battering of prohibition in America), which saw most of the Balvenie’s product go into Grant’s Standfast and "Grant’s" blend, the distillery expands its stills from 2 to 4. A certain young man named David Stewart begins work with William Grant and Sons as an apprentice. Glenfiddich begins to be sold as a Single Malt, but not Balvenie… Yet! The distillery is expanded again as another two stills (one spirit and one wash) are added, bringing the total to 6. This is followed by another expansion of two stills, meaning that the Balvenie now runs 8 stills in total… It is almost like they are gearing up for something, what could that be? Following the precedent set a decade before by Glenfiddich, Balvenie begins to be sold as a single malt beyond Scotland, and the first distillery or "official" bottlings are released. This marks another significant step by the Grant’s in the promotion of Single Malts as a category of whisky, and as specialised, gourmet spirit. Further indicative of Grant’s marketing of Single Malts as a luxury good is the release of Founder’s Reserve, a Balvenie expression (now exceedingly rare and collectible) sold in bottles designed to recall the shape of high-class Cognac bottles. A third Grant’s distillery, and sister distillery to both Glenfiddich and Balvenie, is constructed nearby, named Kininvie. The distillery celebrates 100 years since its foundation. Dave Steward has also now been working at Balvenie for 30 years. 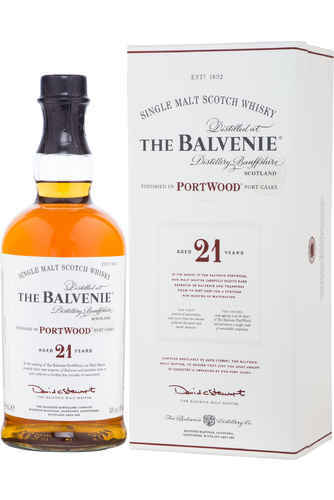 Balvenie first releases its Vintage bottlings, and its famous Port Cask expressions, which have gone on to be a flagship line for the distillery. 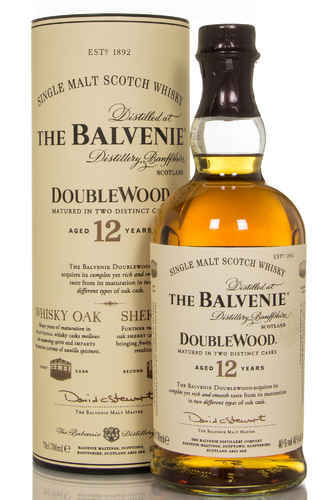 Again demonstrating the distilleries willingness to experiment with cask and flavours, Balvenie releases an Islay Cask expression, matured for 17 years in ex-bourbon barrels, and finished for a few months in barrels that previously held a heavily peated Islay Scotch. The resulting whisky was extremely interesting, with the typical polished honey notes of Balvenie supported by a subtle smoke and slight peaty tang. Balvenie releases one of their most famous, collectable and brilliant bottling. A 50 year old whisky, which had rested in sherry casks since 1952. Only 83 bottles were released, and they were priced at £6,000 each – a price that today seems somewhat modest! This was a tour de force bottling that fully established Balvenie as a top-class whisky producer. A 30 year old bottling of Balvenie is released to mark the 30th anniversary of David Stewart becoming the Malt Master of the distillery. One of the Balvenie’s most popular bottlings first hits the shelves- the 14 year old Rum cask, now known as the Caribbean Cask. For a while this was bottled as the "Cuban Cask"- though because of the trade embargo between American and Cuba these could never be sold in the States. This year also sees the releases of one of Grant’s most important products- Monkey Shoulder Blended Malt. This whisky, a blend of Balvenie, Kininvie and Glenfiddich, was originally conceived as something of a side-project to the main operation of distilling malt whisky, yet it has proved to be one of the run away successes of Grant’s recent history, and in 2014 over 200,000 cases of Monkey Shoulder whisky was sold. After many years of distilling with four sets of two stills, another three stills – one wash, and two spirit – were added to the distillery. Indeed, there are so many stills at Balvenie now that they are split across two rooms! Balvenie releases the oldest member of its standard range- the 40 year old. In the same year, over a million bottles of Balvenie Single Malt were sold, with the distillery amongst the top ten bestselling Single Malts in the world.